Mount ELBRUS IS THE HIGHEST MOUNTAIN IN EUROPE LOCATED IN THE CAUCASUS MOUNTAINS IN RUSSIA, CLOSE TO THE BORDER WITH GEORGIA. IT IS IN FACT A DORMANT VOLCANO WITH TWO SUMMITS COVERED WITH PERMANENT ICE CAPS. SINCE 1986 IT HAS BEEN PART OF THE PRIELBRUSYE NATIONAL PARK, ONE OF THE PROTECTED AREAS IN RUSSIA. Since Mount Elbrus is located in the Southern part of Russia, the majority of trips to Elbrus from Europe have a stop in one of the two biggest Russian cities: Moscow or Saint Petersburg. After that the flight takes the climbers to city of Mineralnye Vody in the Caucasus region, where the real adventure starts. Mount Elbrus is usually climbed in phases, giving time for the body to acclimatize to the altitude. Each day is spent in attempts to climb higher, while overnighting at much lower altitudes to have sufficient rest for the next day’s hike, abiding by the old mountaineering adage, “climb high, sleep low”. Climb the highest mountain in Europe and gaze over the splendid panorama. Get a taste of Caucasian mountain climbing adventure surrounded by unique local traditions. Stay in comfortable huts at a lower altitude and use picturesque cable car during the day. 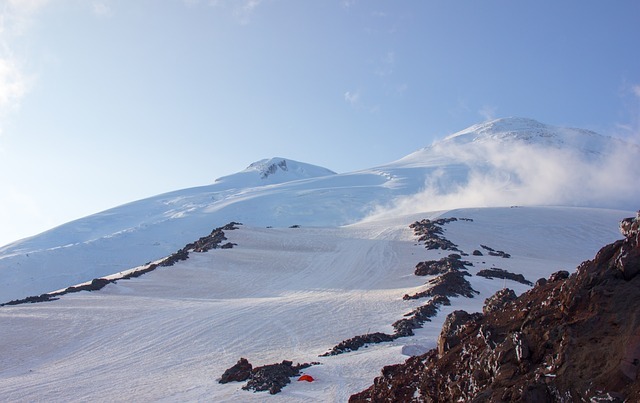 Climbing Mount Elbrus doesn’t pose any severe technical difficulties along the route, however, weather conditions are usually unstable bringing strong winds and exposing ice-covered parts of the trial. Particular care is recommended at all times during the descent, due to steep slopes and rocky terrain. Overall, Elbrus is one of the easiest Seven Summits to attempt due to its accessibility, however, it is worth remembering that at 5642 metres above sea level Mount Elbrus is still 800 metres higher than Mont Blanc. For more information or to book this or many other adventures visit Adventure Consultants.